Opinion: How dangerous is burnt toast? A new campaign is warning people that burning some food, such as toast, is a potential cancer risk. Here, the evidence for this claim is explored by David Spiegelhalter, Professor of the Public Understanding of Risk at the new Winton Centre for Risk and Evidence Communication. Acrylamide can be, in large doses, a very nasty substance. It is used as an industrial sealant, and workers with very high exposures suffered serious neurotoxicity. Very high doses have been shown to increase the risk of mice getting cancer. The IARC (International Agency for Research on Cancer) considers it a ‘probable human carcinogen’, putting it in the same category as many chemicals, red meat, being a hairdresser and shift-work. Remember that each study is testing an association with a long list of cancers, so using the standard criteria for statistical significance, we would expect 1in 20 of these associations to be positive by chance alone. A standard response might be the over-used cliché: ‘absence of evidence is not evidence of absence’. If there has been a huge effort to find an association, and none has been found, it’s true that this may not be direct evidence of the absence of an effect (though this can never be proved anyway). But it can be considered evidence of something that is not very important. Given the numbers provided by EFSA and FSA, it is perhaps unsurprising that no association has been shown in large studies. EFSA calculated a BMDL10 of 170 µg/kg body weight/day — this means it is unlikely that exposures at this level would cause tumours in mice (technically it is the lower end of a confidence interval for the dose that would cause 10% increased tumours). They then compare this with human acrylamide exposure obtained from multiple detailed dietary surveys, which for adults has an average of 0.56 and a ‘high’ of 1.1 µg/kg/day, in the sense that 97.5% of people consume less than this. 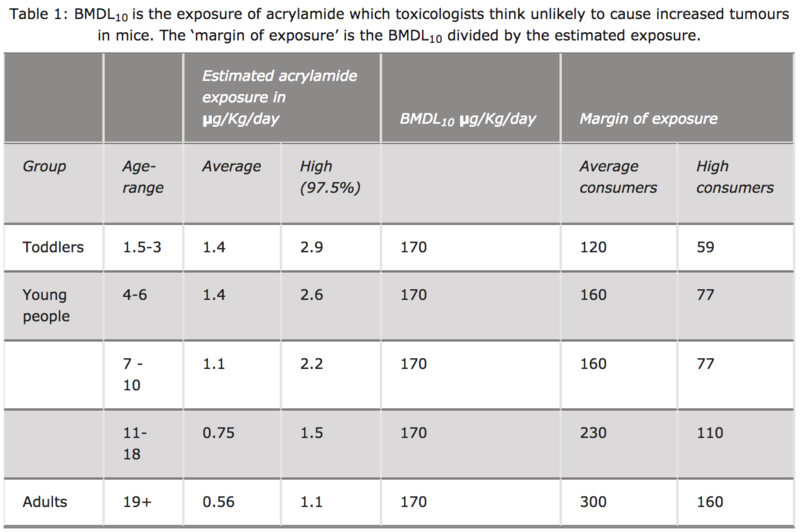 The BMDL10 is then divided by these exposures to give the ‘margin of exposure’, which rather confusingly end up being high for low risks and low for high risks. So, for example, adults with the highest consumption of acrylamide could consume 160 times as much and still only be at a level that toxicologists think unlikely to cause increased tumours in mice (that's essentially what the ‘margin of exposure’ means). This all seems rather reassuring, and may explain why it’s been so difficult to observe any effect of acrylamide in diet. But, for cancer, toxicology committees demand a rather arbitrary margin of exposure of 10,000 before considering the chemical essentially acceptable. Reactions to the FSA’s Go for Gold campaign may range from the extremes of encouraging obsessive concern in the worried-well, to irate editorials on yet another intrusion from the ‘nanny state’. More worrying, people may just consider this yet another scare story from scientists, and lead them to dismiss truly important warnings about, say, the harms from obesity. Cancer Research UK say that “researchers estimate that overweight and obesity are behind around 18,000 cases of cancer each year in the UK”. In stark contrast, the FSA provide no estimate of the current harm caused by acrylamide, nor the benefit from any reduction due to people following their advice. To be honest, I am not convinced it is appropriate to launch a public campaign on this basis. The Winton Centre for Risk and Evidence Communication is a new centre hosted within the Department of Pure Mathematics and Mathematical Statistics.